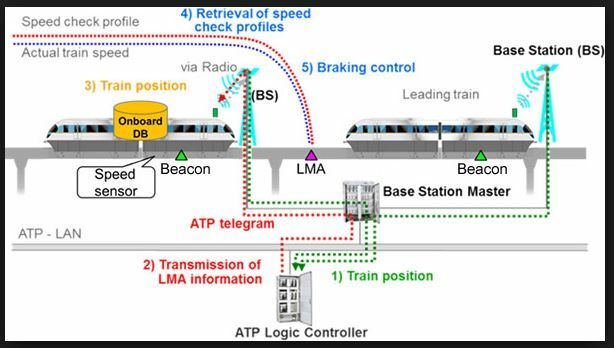 automatic train protection and Automatic train operation functionality, Including safe train automatic or manually driven movement, Including driverless turn back and Accurate station stopping, Automatic door operation and protection. 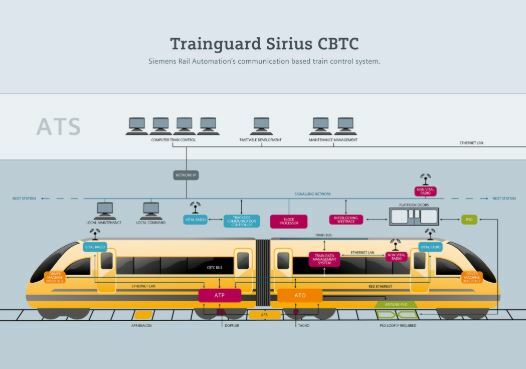 The VOBC is a vital ATP component of the SelTrac CBTC system designed and built redundantly for safety and availability. 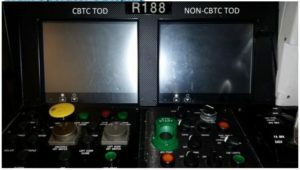 Each train consist has 2 VOBCs installed, one at each end, in a hot-standby configuration, ensuring a high level of availability. 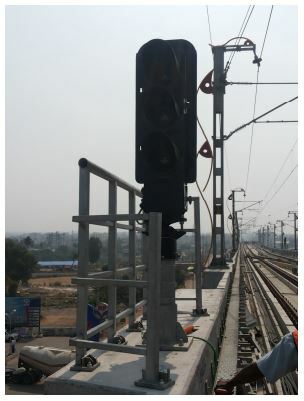 In its operation, the VOBC uses transponder tags (which provide train relocation reference), which are installed along the running tracks. 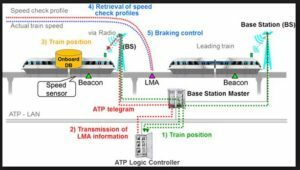 The On-Board CBTC equipment supervises a controlled train’s ability to stop within the Movement Authority. If the train is at risk of traveling beyond the Movement Authority, the VOBC commands EBs (Emergency Brakes). The primary function of the TOD is to allow the train Operator to read the status of various CBTC subsystems and other information such as distance to go, actual speed, and target speed There is one TOD installed in each cab of the train. 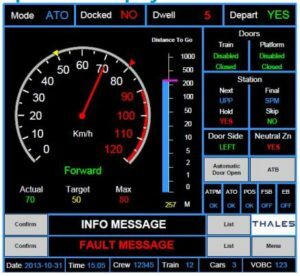 Train Operating Mode information; Door Control Mode Information. 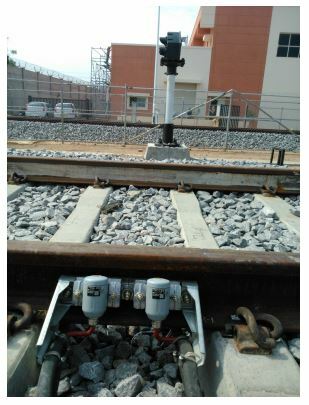 There are two speed sensors per VOBC unit and both are required for operation. Each speed sensor channel generates two output streams which are out of phase by 90 degrees. The two output streams provide the number of pulses per wheel revolution. The frequency of the pulses is proportional to the angular speed of the train wheels. 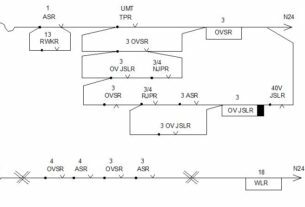 Output from the speed sensor channel is used as input to Peripheral Processor Units within the VOBC for detection of zero velocity, and determination of train speed, travelled distance, and travel direction. There are two accelerometers per VOBC unit and two accelerometers are required for operation. As the accelerometers are mounted on the car body, the accelerometer indicators are used to measure the acceleration and in conjunction with speed sensors, to measure train speed and travelled distance. One proximity sensor is provided per each VOBC unit. The proximity sensor is used to detect the wayside installed proximity plate The proximity sensor provides positive confirmation to the VOBC that the train is properly aligned at a station, pseudo-station or storage lane. 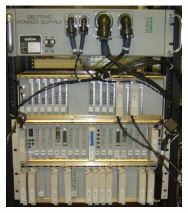 The Mobile Radio Unit is a CBTC component used to provide an interface from VOBC to the ZC and the ATS. There is one Mobile Radio Unit located at each end of the train. Each unit is individually addressable on the network. 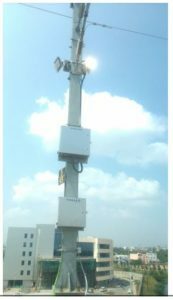 The Mobile Radio Unit consists of MR, network switch and Security Device. MRUs are installed at both ends of the train to maintain communication with the wayside. 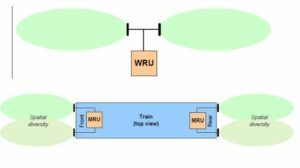 In case of failure of one of the radios or loss of radio signal to a WRU at one end of the train, the system is still fully functional by maintaining communication with a wayside using one radio unit. On-Board, high-gain patch antennas look outwards from the front and rear of the vehicle and “illuminate” (or receive from) only that section of the guideway directly ahead of, or directly behind, the train. Two such antennas are used at each end (i.e. total four antennas per vehicle) in order to provide propagation path diversity at that end. The MRU at each end determines which antenna of the two is providing the best link at any time. The WRUs are inter-connected in a ring topology and this ring is coupled to the untrusted backbone ring via inter-ring switches that run a “ring coupling” redundancy protocol. 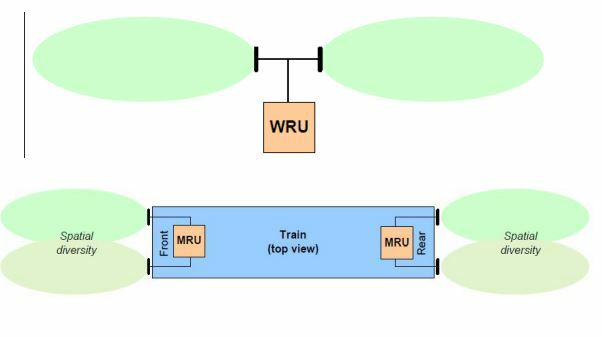 The layout is designed to provide overlap between the WRUs in terms of coverage, such that the failure of a single radio does not cause any degradation in performance. WRUs are strategically placed at certain intervals, so that at any point on the guideway the MRUs are capable of communicating with at least two WRUs. 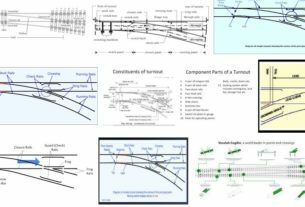 This design ensures that full coverage is maintained even in such cases as: failure of every alternate WRU, failure of a fiber optic cable, and failure of a power supply. separation. The secondary localization system is used for tracking failed equipped trains and non-equipped trains. 2. Green aspect = permissive with reduced speed for Non Communicating trains.